This Uses CF Type Interface with Pins. If you drive does not have this interface obviously this is not going to work. PLEASE NOTE: This is a Very Fragile Unit and should be used delicately. As the Surface mount CF Adapter can be easily broken from the Surface. 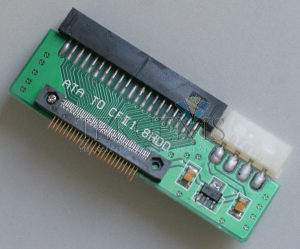 Anyone using this more than once should Hot-Glue the Connector to the Board. No Refunds or Credit Will be given for anyone breaking this connectors solder joints. 03-28-2011 Update: We have redesigned the cf Pin-Connector to make it more Sturdy on the Board. 06-01-2016 Update: Added Activity LED's to Board.